This irresistible salmon recipe from the One Pan, Two Plates cookbook is perfect for two. 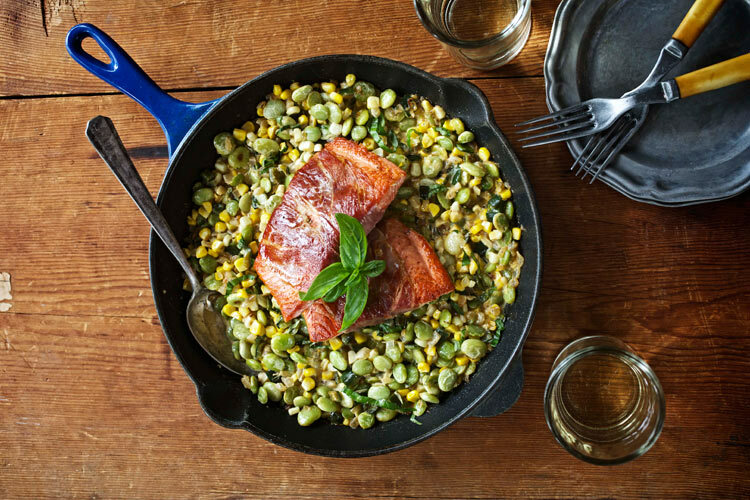 There are few food combos as apt as salmon and corn. Especially when paired with a little air-dried ham, spicy chile, and a touch of cream. You’ll love how the prosciutto “shrink-wraps” to the fish and lends its smoky, salty flavor to the creamy corn and chile that lie beneath. 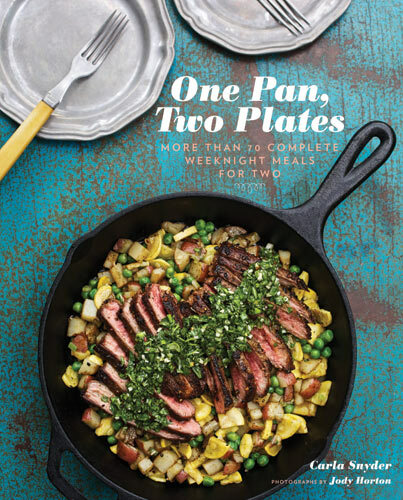 This fantastic salmon recipe from the One Pan, Two Plates cookbook is so simple and delicious, you might find yourself doubling the recipe to serve to company next Saturday night. But let them think you slaved in the kitchen for hours. They don’t need to know how easy it was to pull this meal together. 1. Pat the fillets dry and sprinkle lightly with salt and black pepper (not too much salt, because the prosciutto will be salty). Wrap two slices of prosciutto around each fillet, winding it around from top to bottom. Don’t worry if it doesn’t stick very well; it’ll contract and cling to the fish as it cooks. Set the wrapped fish aside. 2 minutes. Add the corn, lima beans, cayenne, and 1/4 tsp salt. Season with black pepper and sauté until the corn is almost tender, about 1 minute. Quickly pour in the cream and stir in the 1 tbsp basil. Top the vegetables with the fish, cover, and reduce the heat to low. Cook until the fish is cooked through and flakes easily with a fork when pierced, about 3 minutes. Some of the salt from the prosciutto probably crept into the corn, so taste and season with more salt, pepper, or cayenne if it needs it. 4. Mound the vegetables onto two warmed plates and top with the fish and a few basil leaves sprinkled over the top. Serve hot. It’s That Easy: Salmon makes an almost weekly appearance on our dinner table, with one caveat: I avoid the farmed Atlantic salmon when possible. It just doesn’t taste as good as the wild caught coho, king, or sockeye salmon, and the health benefits of the wild fish far outweigh the small uptick in price. An inexpensive source for wild caught salmon is the frozen food case at Trader Joe’s. I periodically load up my freezer so we have an ever-ready supply. A little planning definitely makes for better eating. Extra Hungry? To make this a heartier meal, add another 1/2 cup/70 g lima beans to the succotash. You could also serve a larger piece of fish to that special hungrier person. In the Glass: The indisputable wine to go with this dish is a buttery, lush Chardonnay. Luckily there are gazillions to choose from. Look for California Chardonnays from the Central Coast/Edna Valley/Santa Barbara area. An often recommended bottling from J. Lohr is a great value.